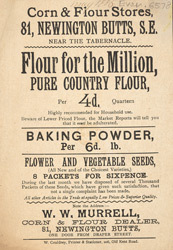 Flour was a dietary staple for thousands of people in the 19th century. If they could not afford to buy bread from a local baker then they could buy the flour and make their own. This leaflet mentions "adulterated" bread - at this time many unscrupulous bakers added alum (a transparent mineral used in dyeing) and chalk to their flour to make their bread whiter and thus more desirable.